Instagram is the most popular photo and video sharing platform. 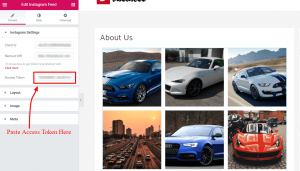 Our widget enables you to display the images directly from your Instagram account on your website pages. You can arrange and style your images as per your need. Now Instagram does not permit displaying images directly from the username. Users need to get access token of their accounts to display images. 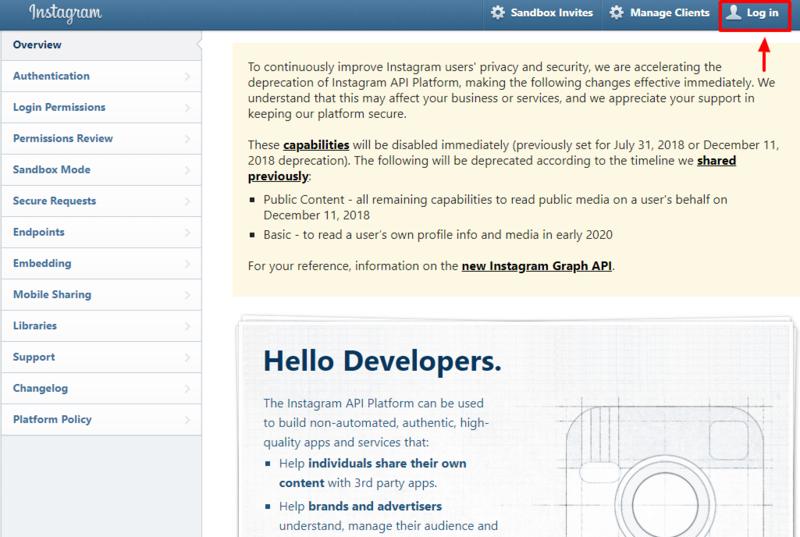 Notice: For security purpose, Instagram keeps changing its policies. We recommend using the method described here to generate the access token. Please follow the same method. 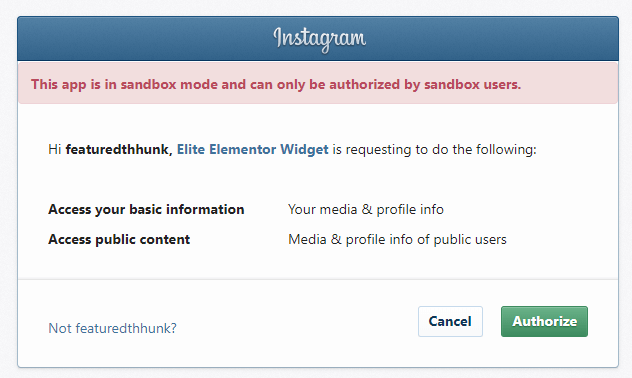 When you choose Instagram Feed widget you will see as shown in the image below. You need two things to get your access token. Those two things are already highlighted for your convenience. The first is your Client Id and the second is Redirect URI. 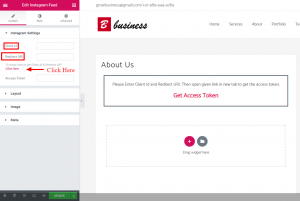 Just click on the Click Here link and you will be sent to our documentation page, where we will show you how to get Client Id and Redirect URI in the safest way possible. You need to create an Instagram Developer Account. If you are not already logged in then you will be sent to a login page. 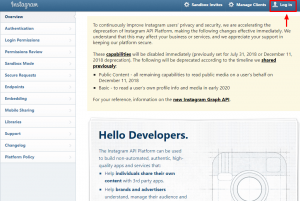 Log in and you will be sent to Instagram Developer Account. 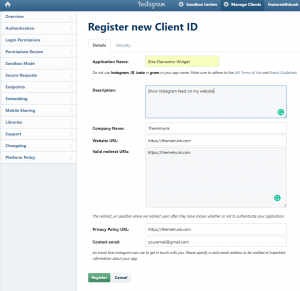 Now go to Manage Clients and register a new client if you are not already registered. A form with basic information to fill will open. Fill all the details. It is mandatory to fill all the details. For Redirect URI, you can use your website’s web address. Then go the security tab. 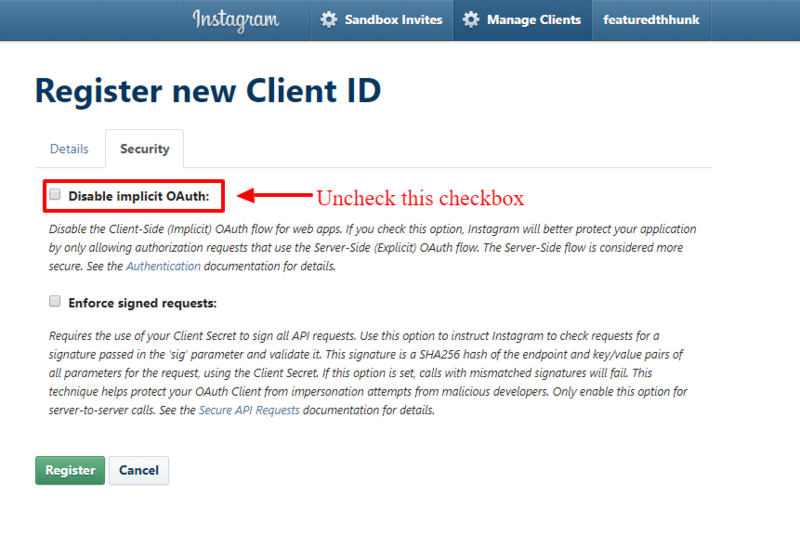 Here you will see a checkbox already checked to mention Disable Implicit OAuth. Uncheck this and register. 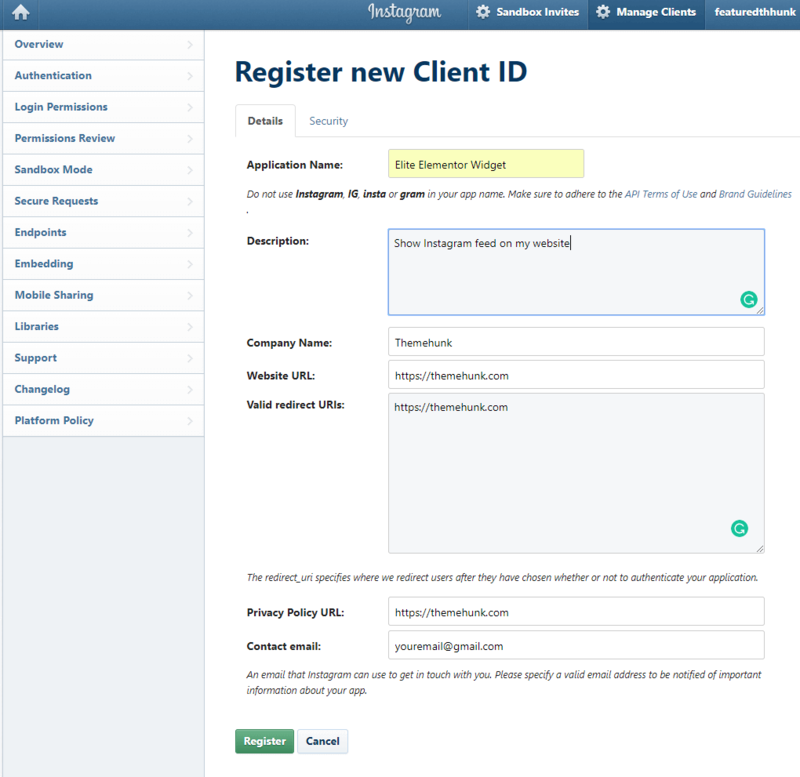 After registering, go to Manage Clients. Here you will see a few details of your account. 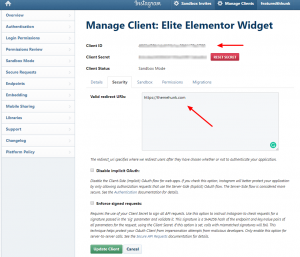 Copy Client Id and Valid Redirect URIs. 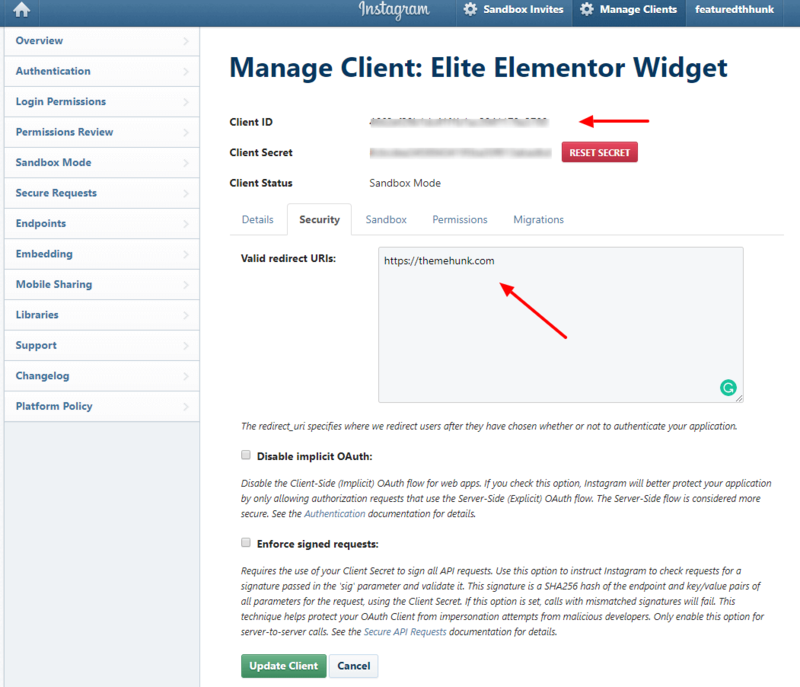 Now paste these details in the mentioned textboxes in Elementor Editor and hide the Elementor Editor. 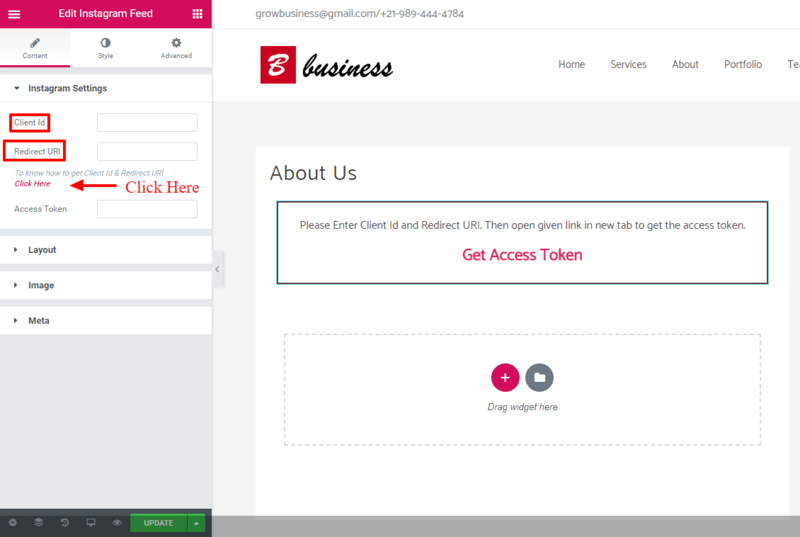 You can see that after entering Client Id and Redirect URIs, Get Access Token link will turn into Pink colored button. Right Click on it and open it in a new tab. If you not logged in, just log in. A confirmation box will appear asking to Authorize the app. 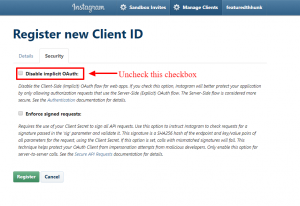 Authorize it and you will be sent to your Redirect URIs with Access Token. 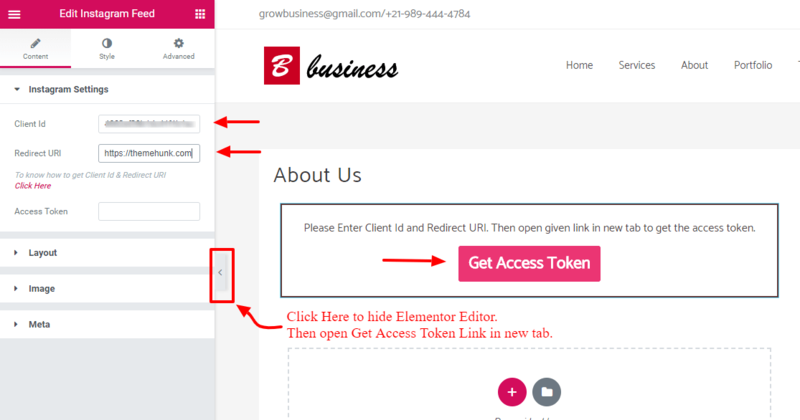 Just Copy the access token and paste it in Access Token textbox on Elementor Editor. Your Images will start to show.